You are looking at one of the last physical remnants of the now defunct "Township" form of government in Washington. A state vote in 1908 granted the formation of County Townships as semi-autonomous, self-governing bodies. Soon thereafter, the Township of Opportunity was organized in 1909 by Spokane Valley agriculturists and speculators who deep-welled into the region's aquifer for apple orchard irrigation purposes. Built in 1912, the Opportunity Township Hall served as the center of the new form of government in Opportunity. The brick and stucco structure was designed by Spokane architect and Opportunity resident C. Harvey Smith in Spanish Colonial Style. The Hall was not just the seat of government in Opportunity, but also served as a popular place for social gatherings, such as weddings, movie showings, and church and library services. Townships were granted the same basic governing rights as most Washington municipalities, including but not limited to property taxation rights. The ability to tax property allowed townships such as Opportunity to thrive economically - especially during the Valley's apple boom that led into the 1930s. By the late-1960s, the Valley's apple industry was all but gone and farms were systematically replaced with strip malls and residential subdivisions. This led to the the decision of state legislators to revoke the right of townships to levy property taxes on May 22, 1969. That decision abruptly ended the foremost economic factor that allowed townships to survive. With the sudden loss of its main source of revenue in 1969, Valley-area townships still hoped to maintain their relevance through the only means of taxation they could muster, that of dog licenses. In 1968 ,Opportunity Township possessed $30,361.61 in funds, by the time Townships were voted to be disorganized by Spokane County electors in 1974 there remained almost nothing in their coffers. The Opportunity Township Hall was given over to the State and eventually to Spokane County in 1990. 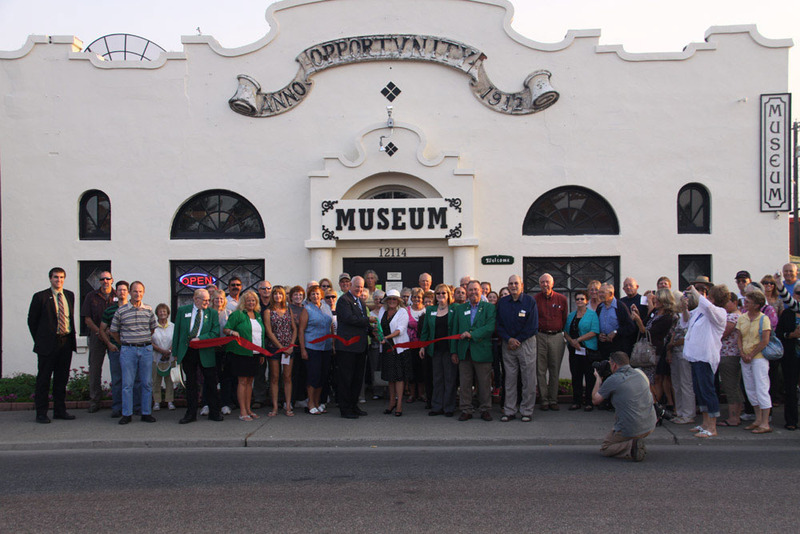 In 2003 the building was given to the newly-formed City of Spokane Valley who, in 2004, handed the deed over to the Spokane Valley Legacy Foundation for the purposes of creating a heritage museum. The museum opened in 2005 and is the only one of its kind in the region. The old building is currently on the National Register of Historic Places. 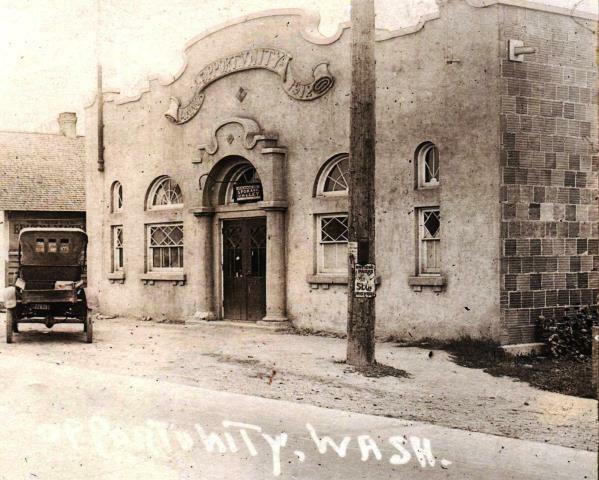 Opportunity Township Hall, circa 1925: From its construction in 1912, until Townships as a legal form of government were abolished in 1974, the Opportunity Township Hall was used for every level of local government administration in Opportunity, WA. Today, the historic building houses the Spokane Valley Heritage Museum. ~ Creator: Image courtesy of Spokane Valley Heritage Museum. Spokane Valley Heritage Museum Grand Opening, 2005.: This photo was taken during the museum's grand opening and ribbon-cutting ceremony in 2005. Before the museum was opened, the building was rented to various businesses by Spokane County - the building's previous owner. ~ Creator: Image courtesy of Spokane Valley Heritage Museum, 2005. An Empty Opportunity Township Hall Building, circa 1970: This is what the building looked like only a few years after the State of Washington officially disbanded townships in 1974. With the level of commercial and residential development in the area, it is surprising that the old building managed to escape demolition. ~ Creator: Image Courtesy of Spokane Valley Heritage Museum. 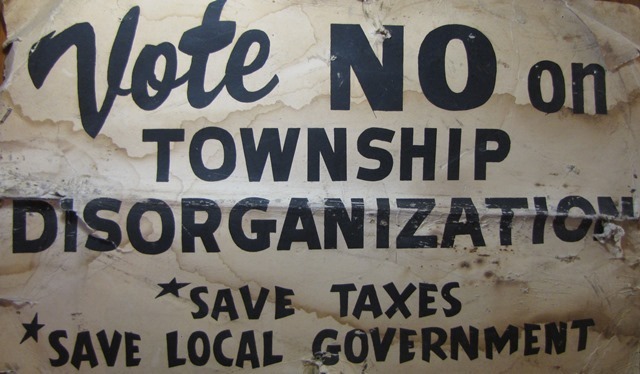 "Vote No on Township Disorganization," 1974.: This sign is from the 1974 Washington State vote to disorganize county townships. Opportunity residents and government officials ran a concerted campaign to tell voters to not allow for disorganization. Their attempts were in vain and the voters of Washington approved the measure to dissolve the State's various townships. ~ Source: Image courtesy of Spokane Valley Heritage Museum, 2015. 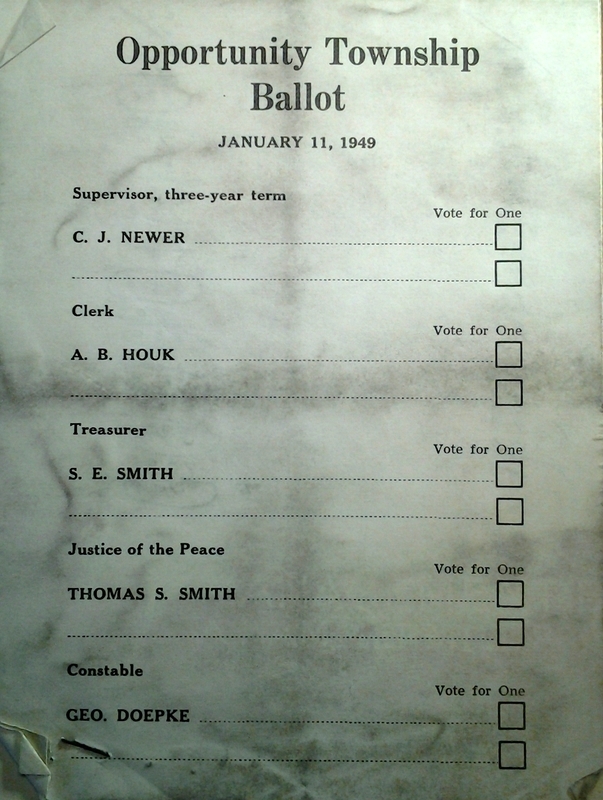 1949 Opportunity Township Ballott: A 1949 ballot found in the Spokane Valley Museum's "Opportunity Township Hall Collection." Every aspect of Opportunity's government was organized within this building, including voting and ballot counting. By 1969, all that the Opportunity Township government could do was tax Opportunity's citizens for pet licenses. ~ Source: Image courtesy of Spokane Valley Heritage Museum, 2015. 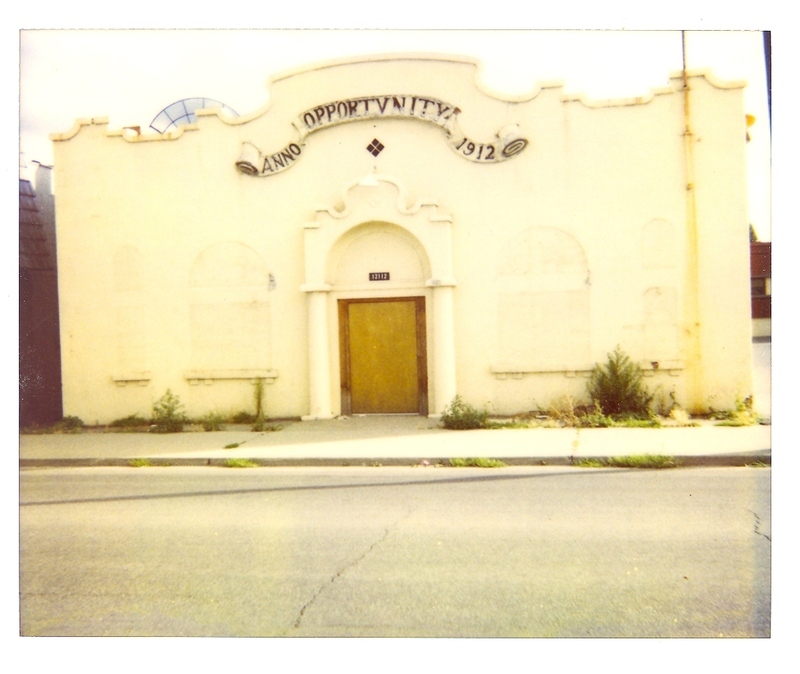 Robert M. Lambeth, “Spokane Valley Heritage Museum/Opportunity Township Hall,” Spokane Historical, accessed April 20, 2019, https://spokanehistorical.org/items/show/558.